The process of world mapmaking has been considered as an essential part of the history of human beings for a thousand years. In Japanese cartography, it was highly influenced by Chinese scholarship as well as European techniques introduced by the Jesuits and the spread of the work of Ricci. In the 1645 Japanese map of the peoples of world, known as Bankoku sōzu, it is identified as one of the most important works based on a Ricci-type map. The map is identified as reflection of western maps which were printed in Nagasaki and were spread throughout the markets of Japan during the sixteenth and seventeenth centuries (Wintle, 2008; Papelitzky, 2014). Click here to view this image in the UBC maps collection. This essay aims to look deeper into the ancient Japanese map, Chikyū bankoku sankai yochi zenzu setsu, produced by Nagakubo Sekisui in 1850. It will determine the reason behind the production of this Japanese world map and the why they had such a worldview during that period. The reference used in producing the map will also be identified as well as the difference found when compared with the prior version of the Japanese world map. Furthermore, I will examine the historical influence of the map and the difference between this 1850 Japanese map and the revised world map. The map is described as a hand-colored woodcut wall map, with the dimensions, 930 x 1640 mm. Other copies of this map are available at Waseda University Library and East Asian Library-U.C. Berkeley. On the upper margin of the map, there is text identified as a discussion of the geographical description of the world.The text is divided into two paragraphs, each beginning with a circle mark. The upper part is read from right to left, across the entire upper register of the image, starting with the title. On the map that divides the earth into northern and southern hemispheres, there is the equator marked across the center. Based on the northern region, you can see that the region is called the “Country of Night”. However, there are no records on the south pole and there is also no information about the people living here. Title is in kanji. Circles before the text. The first version of the woodblock print map was published in 1779 by Asano Yahe and was carved by Murakami Kyube. The preface was written by a famous Confucian scholar in 1775 (Bonhams, 2010; Wigen and Karacas, 2016). As mentioned earlier, the maker of the map was Nagakubo Sekisui. He is considered one of the main cartographers of Japan and the founder of Japanese geography. Sekisui is credited with the creation of numerous maps, travel writings, and innovations such as the first Japanese map to employ lines of latitude and longitude. 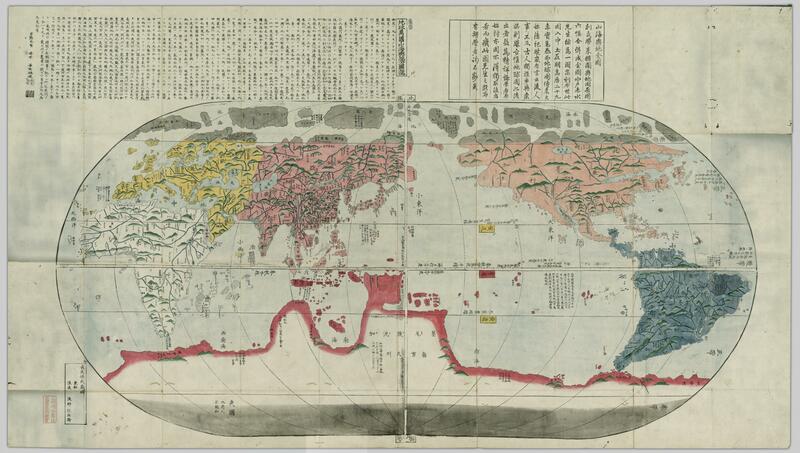 His map was considered to be Japan’s first printed map that made use of a grid. During this time, the linear grid was still a relatively new innovation (Yonemoto, 2003). His work kaisei chikyû bankoku zenzu, published in 1785, was widely distributed and had many editions. It was based on a map by Matteo Ricci. The map is named kunyuwanguo quantu,which is a Chinese form of world map. As such, even the Chinese characters used by Ricci were adapted in Sekisui’s map, although there were also occasions when they were rewritten in Japanese form. There are some interesting descriptions of Brazil included in Sekisui’s map. The notes on Brazil say that the inhabitants of the country dis not build their houses, but instead lived in caverns that they had dug from the earth. The way of life of the people of Brazil was also described in the map. It stated that they their clothing was made from the feathers of birds and that they ate the flesh of men, but not women (Wigen and Karacas, 2016). For about 250 years, the Tokugawa family ruled Japan. During those times, there was strict isolationism, rigid social trade, and regulated contact from the outside world. Evidently, the Japanese had very little contact with the Europeans. However, due to this with this period of isolation there was a blossoming of Japanese culture. Only Chinese and Dutch merchants were permitted to land in Nagasaki at that time. This created some opportunities for cultural exchange, and allowed Chinese and Dutch cartography to influence Japanese mapmakers. In the 1800s, when foreign intrusions became prevalent, the Japanese saw the need to understand their enemies in order to defeat them. This was worsened by the uprising of the citizens who aimed to explore more of the Western world for answers. The tightening of the anti-foreign policy did not do any good as it only resulted in unrest and invited in more Westerners to establish trade relations. The opening up of Japan to western influences did not only lead to cultural changes, but also influenced the way that maps were made. According to Papelitzky (2014), from that time onward maps developed a distinct European appearance and the cartographers came to focus on the accuracy of their work. Accordingly, Sekisui’s map, which was completed in 1850, is a rare piece in that it reflects a Japan on the brink of cultural change. This new style that developed at end of the Edo period, as well as the position of Japan during the then-booming world trade market, is preserved in the map. Undeniably, the 1850 map is a reflection of Japan’s increasing interest in the West. This means that the map served as a display of the fusion of the Edo period’s artistic culture and at the same time the people’s desire to interact with the outside world. This map also represents a time of major cultural change for Japan. At this time, mapmakers did not simply focus on mapping out the provinces and towns, but also emphasized the value of international trade while stylistically holding on to the traditions of Japan. During such an era, it was inevitable that traditional Japanese style world maps would be made with many geographical inaccuracies. Later, Japan entered in a new era when all Japanese borders were opened to the rest of the world. Maps from this point onward developed a distinctly European style and mapmakers began to pay attention to the accuracy of their maps, especially after 1859 when western texts and literature were being translated by the government (Arader Galleries, 2012). Maps produced in the late 18th century and early 19th century were exported to Europe. Sekisui’s map belonging to Philipp Franz von Siebold was eventually donated to the Leiden University Library. The map was highly appreciated by Von Siebold and was considered a veritable dictionary of geography. Even after Von Siebold acquired other newer maps, Sekisui’s map still continued to be consulted (Wigen and Karacas, 2016). This implies that Sekusui’s map was considered to be revolutionary due to its fixed scale and spatial accuracy. Arader Galleries. (2012). The End of the Edo Period: Growing Curiosity of Japan. 12 September. Retrieved March 26, 2016 from http://aradersf.blogspot.ca/2012/09/the-end-of-edo-period-growing-curiosity.html. Bonhams. (2010). Lot 2010: Japanese Map. Retrieved March 26, 2016 from https://www.bonhams.com/auctions/21010/lot/2010/. Kaushik. (2012). “Coming of Age in Cartography: Evolution of the World Map.” Amusing Planet, 5 November. Papelitzky, E. (2014). “A Description and Analysis of the Japanese World Map Bankoku sōzu in Its Version of 1671 and Some Thoughts on the Sources of the Original Bankoku sōzu.” Journal of Asian History, 48 (1): 15-59. Wigen, SF and Karacas, C. (eds). (2016). Cartographic Japan: A History in Maps. Chicago: University of Chicago Press. Wintle, M.J. (2008). Imagining Europe: Europe and European Civilization as Seen from its Margins by the Rest of the World, in the Nineteenth and Twentieth Centuries. Belgium: PIE Peter Lang SA. Yonemoto, M. (2003). Mapping Early Modern Japan: Space, Place, and Culture in Tokugawa Period (1603 – 1868). Berkeley: University of California Press.